Ultrasound is known by many names, including sonogram, sonography and ultrasound imaging. All of these refer to the same process that uses high-frequency sound waves to produce pictures of the inner body. Ultrasound energy is generated by sound waves of 20,000 vibrations per second or greater, far above the frequency detectable by the human ear. The ultrasound transducer gives off sound waves that are reflected back from the organs and tissues, which produces an electronic picture. Because ultrasound images are captured in real time, they can show flowing blood in organs and fetal movements. There is no radiation utilized in obtaining an ultrasound image, and this is a completely safe technique. Its best application is for visualizing "soft tissues," i.e., abdominal and pelvic organs (particularly gallbladder and urinary bladder), blood vessels, thyroid glands and pregnancies, as opposed to other tissues such as bones, lungs and bowels. 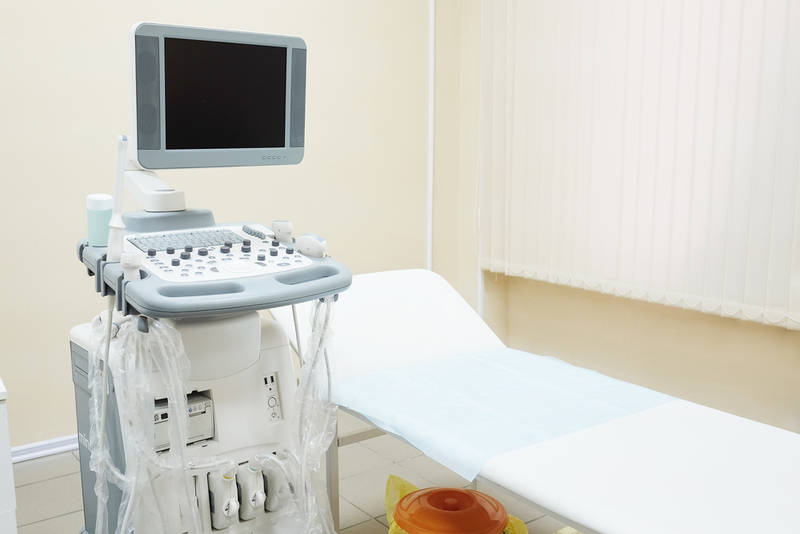 Ultrasound is an important diagnostic tool for evaluating abdominal pain (especially right upper quadrant pain), pregnancies, pelvic pain or bleeding in women, scrotal pain in men, lumps in the thyroid gland, blood clots in leg veins and narrowing of arteries in the neck, abdomen and lower extremities. Ultrasound is an easy, noninvasive test for the patient. You will simply lie on a padded table and the ultrasound technician will begin the examination by applying a clear water-soluble gel to the skin overlying the body part to be examined. The purpose of the gel is to maintain good contact with the skin, as air interferes with the ultrasound signal. The technician then obtains images of the body in multiple views by moving the transducer over the skin. The examination is comfortable and noninvasive, that is, it requires no needles or contrast injections. Some examinations, such as abdominal ultrasound, will require you to fast for 2–4 hours. Other examinations, including pelvic and obstetrical ultrasound, will require a full urinary bladder. Our office staff will provide you with detailed instructions for exam preparation when you call to schedule the appointment. Our office utilizes state-of-the-art digital ultrasound with Doppler capability. We have 5 dedicated ultrasound rooms, each with the same multiservice unit operated by male and female RDMS-certified sonologists. We perform the entire ultrasound gamut, including vascular studies and echocardiography. Technicians are assisted by a physician to obtain the best possible images. With 5 dedicated rooms and the capacity for over 50 patients daily, we can often accommodate ultrasound referrals on short notice.